Of the above-mentioned options, orthodontic extrusion has been shown to be a better option since it does not alter the biological width or the position of the gingival margin of the tooth involved. Orthodontic extrusion is a biological way of exposure of sound tooth structure and therefore requires a prolonged treatment, , as 2 mm subgingival fracture will require an extrusion of about 4 mm. , This 4 mm would be required so that there is a 2 mm sound supragingival tooth structure. This amount of extrusion would normally take about 2-4 months time. More than the duration of the extrusion, it is the difficulty to provide esthetics in the anterior region during the course of treatment which is an area of concern. Loss of esthetics is due to two reasons. One, the fractured tooth is not reconstructed and two, the exposure of the orthodontic brackets during a smile. 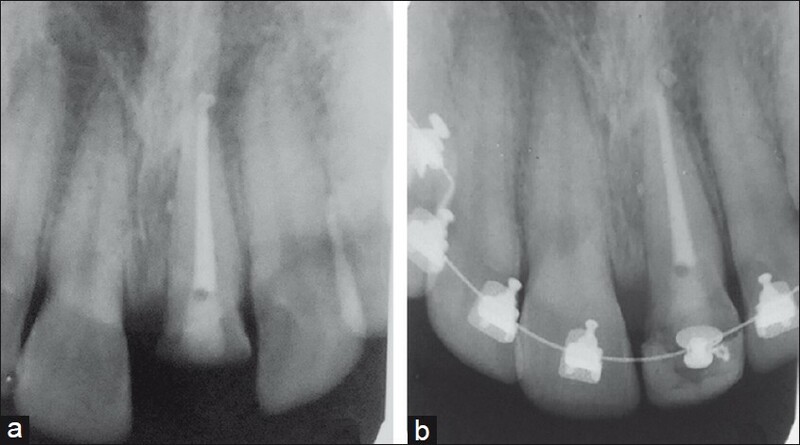 In this case, a different clinical technique has been employed using a multidisciplinary approach in treating a subgingival fracture while maintaining the esthetics to an extent that the patient is also psychologically comfortable during the course of treatment. A 35-year-old male patient reported to Department of Conservative Dentistry and Endodontics with a fracture of tooth #21 due to fall from a motorcycle on the previous day. Past dental history revealed that #21 was root canal treated 2 months back and the patient had not been for the crown. On clinical examination, the fracture line was oblique, with the fracture extending 1-2 mm supragingival on the labial surface and up to 2 mm subgingival on the proximal and palatal side [Figure 1]a and b. Radiographic examination revealed that the obturation was satisfactory and there was no associated fracture and the root, and lamina dura remained intact [Figure 2]a. The patient was very keen on saving the tooth and requested establishment of esthetics at the earliest. A tentative treatment plan of endodontic treatment followed by lingual orthodontic extrusion and a crown with a dowel and core was planned. As the patient requested maintenance of esthetics during the course of treatment, orthodontic extrusion was planned with lingual orthodontics so that the brackets are not exposed. Since the tooth had a satisfactory obturation, the entrance filling alone was changed to composite resin so that the bonding of the orthodontic bracket was on the resin and not on Glass ionomer cement (GIC). The button brackets were fixed on the lingual surface of the involved tooth, 2 mm cervical to the usual position, and tied with 0.012″NiTi arch wire [Figure 1]c. Then, a provisional buildup of the tooth with composite resin was done in the form of a laminate to restore esthetics. As advised by various authors, a force of 0.2-0.3 N was used. , Patient was recalled every week to judge the amount of extrusion. The desired extrusion of 4 mm required about 6 weeks. The extrusion was also evident on intra oral periapical (IOPA) radiograph [Figure 2]b. After the desired amount of extrusion as observed in [Figure 1]d, surgical re-contouring of the labial gingival margin followed by supracrestal fibrotomy was done. The orthodontic appliance was left passive for 2 months to stabilize the achieved extrusion. Patient was recalled after 2 months and the orthodontic appliance was debanded. The provisional composite buildup was then removed and the tooth was prepared for a post and core. A direct wax pattern was made for a post and core and was sent to the laboratory for fabrication. A chairside provisional crown was made and the patient was recalled after a day for cast post and core cementation. The cast post was cemented with resin cement [Figure 1]e and a new provisional crown was made. Supracrestal fibrotomy was repeated and the provisional crown was cemented. After 3 months, an impression was made and zirconia layered with e-max ceramic crown was cemented [Figure 1]f.
Forced orthodontic extrusion can be defined as a movement of vertical translation in a coronal direction obtained through the application of continuous light forces. Orthodontic extrusion of a subgingival fracture was reported as early as 1973 by Heithersay. Thereafter, there have been many reports of management of subgingival fracture by orthodontic extrusion [Table 1]. Most of the cases of extrusion of central incisor were managed with a labially placed, either removable or fixed orthodontic appliance which could be a compromise on anterior esthetics. Such exposure of the appliance along with the fractured tooth during the course of treatment can be avoided if lingually placed orthodontic appliance can be used, which is evident in [Figure 1]d.
Lingual orthodontic extrusion of a central incisor had been attempted to improve and develop the implant site. In a case reported by palone et al., they could not restore the tooth with a prosthetic crown as the crown-root ratio was not favorable. Lingual placement of brackets not only prevents the display of the appliance but also allows us to reconstruct the tooth for better esthetics. The laminate was built 1 mm short when compared to the contralateral tooth to prevent dislodgment upon protrusive movement as the tooth extrudes. In the present case, we also limited our forced eruption within the maximum limit of 5 mm  to avoid relapse and to maintain proper crown-root ratio for a favorable prosthetic restoration. After the extrusion, it was observed that the gingival margin had migrated coronally. Gingival recontouring was done to reposition the gingival margin in line with the contralateral tooth for good esthetics. A circumferential supracrestal fibrotomy was also performed to prevent reverse movement of the root (i.e.) intrusion to the earlier position). , Further, it was repeated 4 weeks later as suggested by Heda et al. Retention period to prevent relapse has also been suggested. Although the recommendation varies from 1 week to about 1 month per millimeter of extrusion,  in this case, a period of 60 days was given. Alternatively, an over-extrusion was also suggested,  but this was not done because it could delay the final crown as we have to wait till the relapse is over and is unpredictable. Another option is surgical extrusion as suggested by Caliskan et al. This procedure in not without a risk of poor long-term esthetic problem. Surgical extrusion may also require more motivation to obtain consent from the patient. Thus, in this case, apart from achieving the goal of extrusion for crown ferrule and long-term restorative success, we have tried to achieve esthetics during the course of treatment also, so that the extrusion is not only in a biological way but also ensures a psychological comfort as the patient need not compromise on anterior esthetics. 1. Olsburgh S, Jacoby T, Krejci I. Crown fracture in the permanent dentition: Pulpal and restorative considerations. Dent Traumatol 2002;18:103-15. 2. Villat C, Machtou P, Naulin-Ifi C. Multidisciplinary approach to the immediate esthetic repair and long-term treatment of an oblique crown-root fracture. Dent Traumatol 2004;20:56-60. 3. Poi WR, Cardoso Lde C, de Castro JC, Cintra LT, Gulinelli JL, de Lazari JA. Multidisciplinary treatment approach for crown fracture and crown−root fracture - A case report. Dent Traumatol 2007;23:51-5. 4. Kocadereli I, Tasman F, Guner SB. Combined endodontic−orthodontic and prosthodontic treatment of fractured teeth. Case report. Aust Dent J 1998;43:28-31. 5. Biggerstaff RH, Sinks JH, Carazola JL. Orthodontic extrusion and biologic width realignment procedures: Methods for reclaiming nonrestorable teeth. J Am Dent Assoc 1986;112:345-8. 6. Valerio S, Crescini A, Pizzi S. Hard and soft tissue management for restoration of traumatized teeth. Pract Periodontics Aesthet Dent 2000;12:143-50. 7. Paolone MG, Kaitsas R, Paolone G, Kaitsas V. Lingual Orthodontics and Forced Eruption: A Means for Osseous and Tissue Regeneration - Case Report. ProgOrthod 2008;9:46-57. 8. Yoeli Z, Samet N, Miller V. Conservative approach to post-traumatic treatment of maxillary anterior teeth: A clinical report. J Prosthet Dent 1997;78:123-6. 9. Bielicka B, Bartkowiak M, Urban E, Tomasz M. Holistic Approach in the Management of Subgingivally Fractured Premolar Tooth- Case Report. Dent Med Probl 2008;45:2114. 10. Johnson GK, Sivers JE. Forced eruption in crown-lengthening procedures. J Prosthet Dent 1986;56:424-7. 11. King NM, So L. A laboratory fabricated fixed appliance for extruding anterior teeth with subgingival fractures. Pediatr Dent 1988;10:108-10. 12. Brown GJ, Welbury RR. Root extrusion, a practical solution in complicated crown−root incisor fractures. Br Dent J 2000;189:477-8. 13. Arhun N, Arman A, Ungor M, Erkut S. A conservative multidisciplinary approach for improved aesthetic results with traumatized anterior teeth. Br Dent J 2006;20:509-12. 14. Heda CB, Heda AA, Kulkarni SS. A multi−disciplinary approach in the management of a traumatized tooth with complicated crown−root fracture: A case report. J Indian Soc Pedod Prev Dent 2006;24:197-200. 15. Bate AL, Lerda F. Multidisciplinary approach to the treatment of an oblique crown-root fracture. Dent Traumatol 2010;26:98-104. 16. Delivanis P, Delivanis H, Kuftinec MM. Endodontic-orthodontic management of fractured anterior teeth. J Am Dent Assoc 1978;97:483-5. 17. Simon JH. Root extrusion. Rationale and techniques. Dent Clin North Am 1984;28:909-21. 18. Balkenhol M, Wöstmann B, Rein C, Ferger P. Survival time of cast post and cores: A 10-year retrospective study. J Dent 2007;35:50-8. 19. Zhi-Yue L, Yu-Xing Z. Effects of post-core design and ferrule on fracture resistance of endodontically treated maxillary central incisors. J Prosthet Dent 2003;4:368-73. 20. Spear F. A patient with a central incisor fractured apically in relation to the gingival margin. J Am Dent Assoc 2009;140:355-9. 21. Ivey DW, Calhoun RL, Kemp WB, Dorfman HS, Wheeles JE. Orthodontic extrusion: Its use in restorative dentistry. J Prosthet Dent 1980;43:401-7. 22. Caliskan M.K, Turkun M, Gomel M. Surgical extrusion of crown−root−fractured teeth: A clinical review. Int Endod J 1999;32:146-51. 23. Balkland LK. Endodontic considerations in dental trauma. In: Ingle JI, Balkland LK, editors. Endodontics. 5th ed. Ontario: BC Decker Inc; 2002. p. 811. Maitin, N. and Maitin, S. and Rastogi, K. and Bhushan, R.